Face Recognition Performance Improvement using a Similarity Score of Feature Vectors based on Probabilistic Histograms, SRIKOTE, G., MEESOMBOON, A.
Quantitative Analysis of Memristance Defined Exponential Model for Multi-bits Titanium Dioxide Memristor Memory Cell, DAOUD, A. A. D., DESSOUKI, A. A. S., ABUELENIN, S. M.
Wind Power Prediction Based on LS-SVM Model with Error Correction, ZHANG, Y., WANG, P., NI, T., CHENG, P., LEI, S.
BHURTAH-SEEWOOSUNGKUR, I. , CATHERINE, P. C. , SOYJAUDAH, K. M. S.
Progressive Edge Growth (PEG) constructions are usually based on optimizing the distance metric by using various methods. In this work however, the distance metric is replaced by a different one, namely the betweenness centrality metric, which was shown to enhance routing performance in wireless mesh networks. A new type of PEG construction for Low-Density Parity-Check (LDPC) codes is introduced based on the betweenness centrality metric borrowed from social networks terminology given that the bipartite graph describing the LDPC is analogous to a network of nodes. The algorithm is very efficient in filling edges on the bipartite graph by adding its connections in an edge-by-edge manner. The smallest graph size the new code could construct surpasses those obtained from a modified PEG algorithm - the RandPEG algorithm. To the best of the authors' knowledge, this paper produces the best regular LDPC column-weight two graphs. In addition, the technique proves to be competitive in terms of error-correcting performance. When compared to MacKay, PEG and other recent modified-PEG codes, the algorithm gives better performance over high SNR due to its particular edge and local graph properties. R. Gallager, "Low-density parity-check codes," IRE Transactions on Information Theory, vol. 8, no. 1, pp. 21-28, 1962. D. MacKay, "Good error-correcting codes based on very sparse matrices," IEEE Transactions on Information Theory, vol. 45, no. 2, pp. 399-431, 1999. 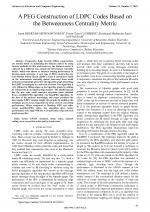 J. M. F. Moura, J. Lu, H. Zhang, "Structured low-density parity-check codes," in IEEE Signal Processing Magazine, vol. 21, no.1, pp. 42-55, 2004. C. A. Cole, S. G. Wilson, E. K. Hall, T. R. Giallorenzi, "Analysis and Design of Moderate Length Regular LDPC Codes with Low Error Floors," in 40th Annual Conference on Information Sciences and Systems, Princeton, NJ, 2006, pp. 823-828. C. -C. Wang, S. R. Kulkarni, H. V. Poor, "Finding all small errorprone substructures in ldpc codes," IEEE Transactions on Information Theory, vol. 55, no. 5, pp. 1976-1999, 2009. J. Campello, D. S. Modha, S. Rajagopalan, "Designing ldpc codes using bit-filling," in IEEE International Conference on Communications, Helsinki, 2001, pp. 55-59. J. Campello, D. S. Modha, "Extended bit-filling and ldpc code design," in IEEE Global Telecommunications Conference (GLOBECOM '01), San Antonio, TX, 2001, pp. 985-989. Y. Kou, S. Lin, M. P. C. Fossorier, "Low-density parity-check codes based on finite geometries: A rediscovery and new results," IEEE Transactions on Information Theory, vol. 47, no. 7, pp. 2711-2736, 2001. R. M. Tanner, D. Sridhara, A. Sridharan, T. E. Fuja, D. J. Costello, "Ldpc block and convolutional codes based on circulant matrices," IEEE Transactions on Information Theory, vol. 50, no. 12, pp. 2966-2984, 2004. H. -Y. Liu, X. -Y. Lin, L. -R. Ma, J. Chen, "On the stopping distance and stopping redundancy of finite geometry ldpc codes," IEICE Trans. Fundam. Electron. Commun. Comput. Sci., vol. E91-A, no. 8, pp. 2159-2166, 2008. Y. Cui, X. Si, Y. Shen, "A novel algorithm of constructing ldpc codes with graph theory," in IEEE Conference on Cybernetics and Intelligent Systems, Chengdu, Sept. 2008, pp. 602-605. X. -Y. Hu, E. Eleftheriou, D. Arnold, "Regular and irregular progressive edge-growth tanner graphs," IEEE Transactions on Information Theory, vol. 51, no. 1, pp. 386-398, 2005. A. Venkiah, D. Declercq, C. Poulliat, "Design of cages with a randomized progressive edge-growth algorithm," IEEE Communications Letters, vol. 12, no. 4, pp. 301-303, 2008. P. Prompakdee, W. Phakphisut, P. Supnithi, "Quasi cyclic-ldpc codes based on peg algorithm with maximized girth property," in International Symposium on Intelligent Signal Processing and Communications Systems (ISPACS), Chiang Mai, Dec. 2011, pp. 1-4. Z. Fan, W. Zhang, X. Liu, H. Cheng, "An improved algorithm for constructing qc-ldpc codes based on the peg algorithm," in Fourth International Conference on Communications and Networking in China (ChinaCOM), Aug. 2009, pp. 1-4. Y. Huang, Y. Cheng, Y. Zhang, H. Han, "Construction of non-binary quasi-cyclic ldpc codes based on peg algorithm," in 12th IEEE International Conference on Communication Technology (ICCT), Nanjing, Nov. 2010, pp. 266-268. L. Huang, Y. Wang, P. Gong, "An improved construction method of qc-ldpc codes based on the peg algorithm," in Third Pacific-Asia Conference on Circuits, Communications and System (PACCS), Wuhan, July 2011, pp. 1-4. Z. Zhou, X. Li, D. Zheng, K. Chen, J. Li, "Extended peg algorithm for high rate ldpc codes," in IEEE International Symposium on Parallel and Distributed Processing with Applications, Chengdu, Aug. 2009, pp. 494-498. P. C. Catherine, K. M. S. Soyjaudah, "A density-based progressive edge-growth matrix creation technique for ldpc codes," in 6th International Symposium on Turbo Codes and Iterative Information Processing (ISTC), Brest, Sept. 2010, pp. 211-215. C. T. Healy, R. C. de Lamare, "Decoder optimised progressive edge growth algorithm," in IEEE 73rd Vehicular Technology Conference (VTC Spring), Yokohama, May 2011, pp. 1-5. S. Khazraie, R. Asvadi, A. H. Banihashemi, "A peg construction of finite-length ldpc codes with low error floor," IEEE Communications Letters, vol. 16, no. 8, pp. 1288-1291, 2012. G. Srirutchataboon, A. Bajpai, L. Wuttisittikulkij, P. Kovintavewat, "Peg-like algorithm for ldpc codes," in International Electrical Engineering Congress (IEECON), Chonburi, March 2014, pp. 1-4. M. Kas, S. Appala, C. Wang, K. M. Carley, L. R. Carley, O. K. Tonguz, "What if wireless routers were social? approaching wireless mesh networks from a social networks perspective," in IEEE Wireless Communications, vol. 19, no. 6, pp. 36-43, Dec. 2012. T. V. Nguyen, A. Nosratinia, "Rate-compatible short-length protograph ldpc codes," IEEE Communications Letters, vol. 17, no. 5, pp. 948-951, 2013. I. Diop, S. M. Farssi, M. Ba, H. B. Diouf, "Construction of codes protographes ldpc quasi-cycliques based on an arithmetic progression," in Second International Conference on Innovative Computing Technology (INTECH), Casablanca, Sept. 2012, pp. 194-199. [Online]. M. Karimi, A. H. Banihashemi, "On the girth of quasi-cyclic protograph ldpc codes," IEEE Transactions on Information Theory, vol. 59, no. 7, pp. 4542-4552, 2013. 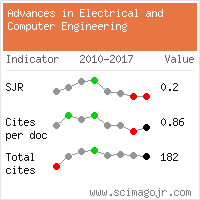 Citations for references updated on 2019-04-21 23:02 in 181 seconds. Website conception, design and maintenance by Eugen COCA. Content updated on 28 Feb 2019. Site engine updated on 28 Feb 2019. This page was generated on the server in 0.103 seconds and loaded in your browser in > seconds.